You are in the ICU waiting room. The feeling of unreality that your loved one has suffered a severe brain injury hasn’t even started to wear off. Yet here are doctors and nurses cryptically explaining the nature of the medical crisis so that they can get your consent to provide necessary care to maintain life. That care may include brain surgery. While they use words about brain anatomy that they assume you must know – brain hemorrhage, lobes, intracranial pressure, ICP, hematoma, subdural – you can barely fathom that you are sitting there, more less follow what they are talking about. You get it. Your loved one might die if they don’t intervene. You do not need to be a doctor to say “yes.” But once the whirlwind of that permission is over, you are left to wait for news and try to sort out what it is they just told you was happening. As I explain to people in the support group I run: “How many times did you think of severe brain injury before you were struck with this injury? Not much, I’m sure.” And that was the thing. It was the unknown. What are we getting into? 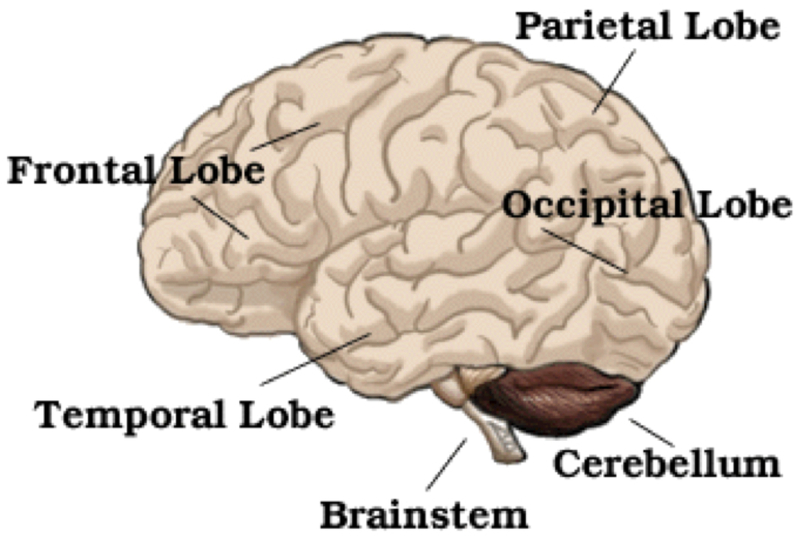 What is brain injury? We had no idea and no one could (or would) tell you. There isn’t an article and nobody’s got a computer; you’re just sitting waiting. When you’re in that kind of unit, there was just death all around you. I mean, no one was surviving. So, you were holding on by a thread. To view Michelle talking about the need for info on brain anatomy at the time of crisis click here. We hope that smart phones and Ipads mean that there is a kind of computer in the ICU. Assuming you are using one, we start with Brain Anatomy, 101. The brain is divided into two hemispheres, right and left. 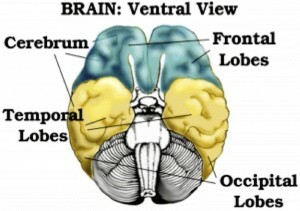 The brain has multiples lobes, with the principal ones shown below, in both hemispheres. 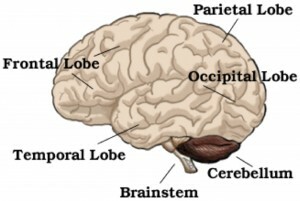 Key to understanding brain anatomy is to understand that these divisions are not like dividing a house into rooms. 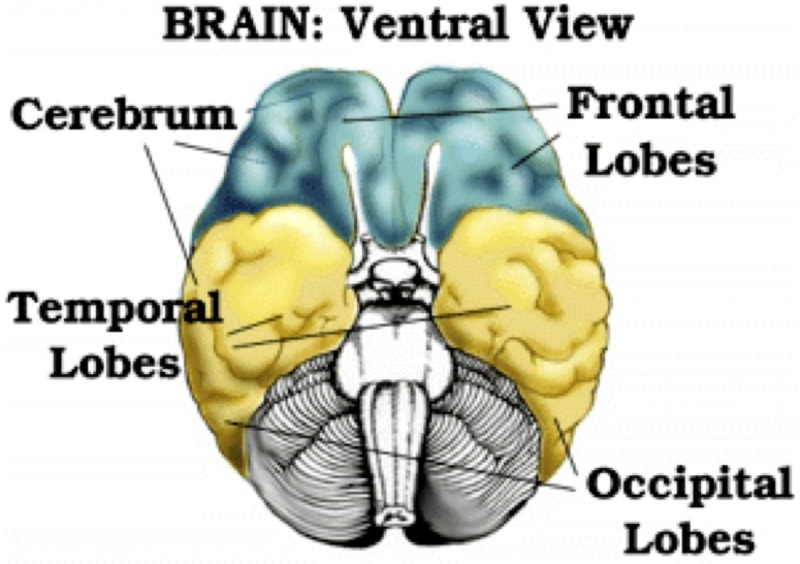 While there is a clear delineation between the two hemispheres, the lobes should be thought of more as regions of brain function, rather than specific compartments. While it is helpful to know what part of the brain is meant by the “frontal lobes”, the geographic dividing line between the frontal lobes and the other lobes is a soft barrier. Brain structures are not hard objects, as the brain has more the consistency of jello than the hard plastic models you might see on the neurosurgeon’s desk. This jello like brain material can move within the skull, the structures can be compressed or distorted, neurons and axons criss-cross different regions of the brain. All of these elements are important to understand how the brain gets injured and what neurosurgical interventions can do to reduce permanent brain damage after severe brain injury and coma.